From the comments, it seems the gentleman works at Ralph Lauren. He’s got that look down. The trick is in the fit and the very dressy dark denim. Casual doesn’t have to mean un-tailored. 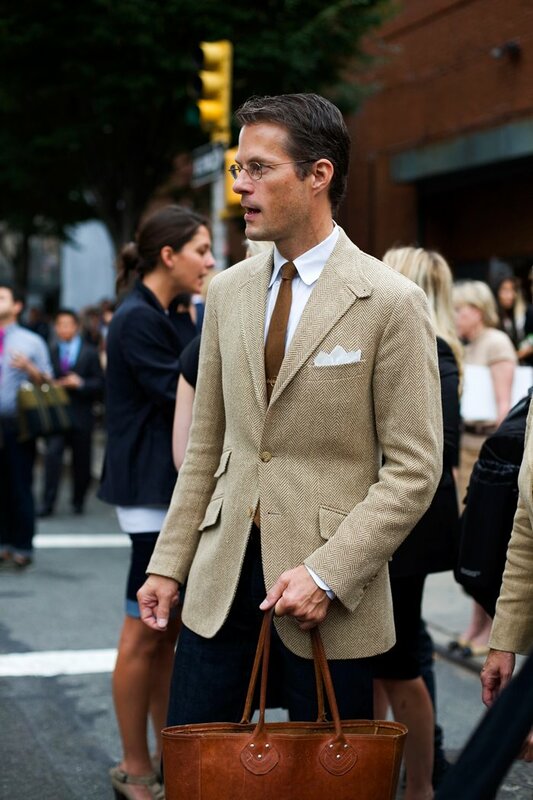 This entry was posted in Elegantology and tagged casual clothing, The Sartorialist. Bookmark the permalink. Style Forum would say his sleeves are too long, but it all works. I think the length of the jacket and the slanted pockets work to lengthen. What type of lapels are those? Mr. West, I’d have to agree. But it may be the very soft shirt he’s wearing, too. Hello Turling, it’s a notch lapel, but adapted (I think) from a Ghillie collar. There should be a button under the opposite lapel to allow you to close the throat latch in inclement weather. I am wearing a Harris tweed coat today with a detachable throat latch. Very handy. Beautiful, a tad perfect perhaps. Makes me want to muss his hair. Any clue who made that bag or a similar one? its amazing!! He also seems quite thin. Which helps. Alas, I am not. When garbed thusly, I tend to look like a country squire. sean, check in at The Sartorialist. Someone knows. AL, I empathize. Although, Squire, there are worse looks. The thinner lapels and tie help. I have a lot of catching up to do on your blog, but wanted you to know how handy this post was last night. A friend’s son inherited a dashing jacket and in discussing its origin, he was asked about the lapel. While people wondered aloud about its purpose, I was able to offer an answer. I suggested he check the opposite side for a button & sure enough! I didn’t claim the knowledge as my own. I told him I’d link him to the site that educated me, so you’ll likely have a few more readers today. Thanks, as always, for your great postings.